Free Shipping Included! H Potter Planter Rectangular Pot Flower Indoor Outdoor Window Box (Antique Copper) 12'' x 4'' x 4'' by H Potter at Tulips Orchids. MPN: GAR583 ANT.. Hurry! Limited time offer. Offer valid only while supplies last. 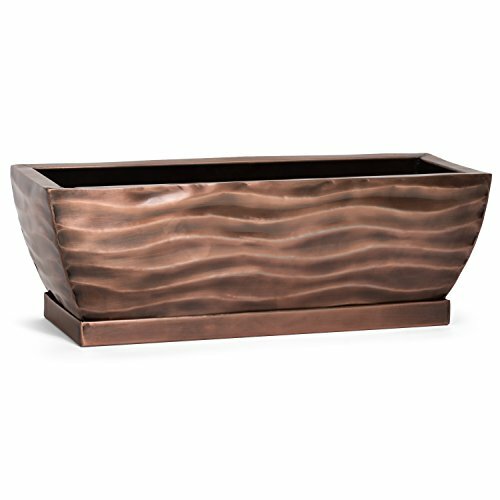 HANDCRAFTED - HOME DÉCOR ACCENT - Stainless steel rectangular planter box with an antique copper finish for luxurious appeal. This indoor planter box is current with a timeless feel. Use indoors as an herb planter on a windowsill to connect with the outdoors or place outdoors on your patio, deck, or tabletop. Complete with custom rectangular drainage tray, this home décor accent is designed to add character to your living space. No plants included. PLANTER FOR ALL SEASONS - At 12 inches long by 4 inches wide by 4 inches high, this planter garden box will make an eye-catching focal point and impressive statement wherever it's placed. Sold as a single garden planter, beautiful displayed as centerpieces or multiples lining your dining table. Unique and sturdy, if you're looking for something memorable, this beautiful window box planter would make a perfect wedding decoration or birthday gift idea. HEAVY AND DURABLE CONSTRUCTION - Built to last, use with any seasonal décor. Stunning filled with herb pots or flower pots and covered with sheet moss or plant directly inside the metal planter. Easy to update and freshen your holiday decor. Try a color theme this season and a texture theme next month. Simple enough to blend with any home décor. Trending now, the rich black nickel finish adds earthy warmth to your traditional or modern home. INTRICATE DETAILING - MINIMALIST STYLE - Plants not only promote a healthy home environment but can offer a touch of elegant beauty to your home and garden. Uniquely designed with a heavy, durable construction, the H Potter rectangular succulent planter is perfect for alfresco dining and outdoor living. Tranquility of greenery is an ideal mood setter and stress reliever, this gardening planter is the perfect size to fit any location and can be moved easily.